J. W. Fishers SEAOTTER-2 - klikk for pdf. J. W. Fishers SEAOTTER-2 and SEALION-2- klikk for pdf. J. W. Fishers SEALION-2- klikk for pdf. J. W. Fishers SCAN-650- klikk for pdf. J. W. Fishers ON SCREEN DISPLAY - klikk for pdf. J. W. Fishers videoprodukter - klikk for pdf. Dataark for 6X og 8X metalldetektor. The SeaOtter-2 has many of the same features of the SeaLion, but is not as powerful. 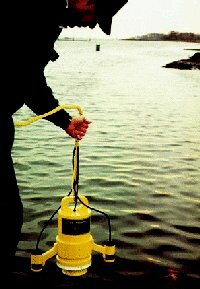 It is best suited to working in areas with low to medium currents. This ROV also has front and rear facing color cameras with pan and tilt. Illumination for the front camera is provided by two very bright 50 watt tungsten halogen bulbs. Lighting for the rear camera is provided by a ring of high intensity LEDs. The SeaOtter-2 has a 500 foot depth rated housing and comes with 250 feet of cable. System controls are cleanly laid out in a high impact waterproof case with an ultra bright 10.4 inch flat screen monitor built into the lid. Command of the ROV's thrusters, cameras, and lights are managed with a PS2 controller. 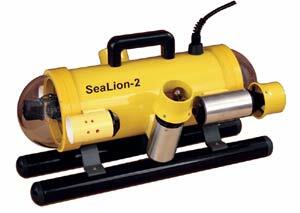 The SeaLion-2 is Fishers top-of the-line ROV. It has four high performance motors that make it faster than the SeaOtter-2. In addition, even more thrust is available with a Power Boost feature that provides the ROV with an extra burst of speed when heavier currents are encountered. 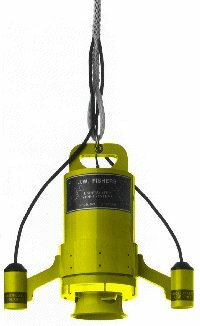 Other advantages are a 1,000 foot depth rated housing and the ability to operate with cable lengths up to 1,500 feet. Other features include front and rear facing color cameras with pan and tilt. Illumination for the front camera is provided by two powerful 100 watt tungsten halogen bulbs. Lighting for the rear camera is provided by a ring of high intensity LEDs. Med dette kameraet har du blandt annet mulighet for å velge blandt to lysalternativer. Det første er en intern lysring. 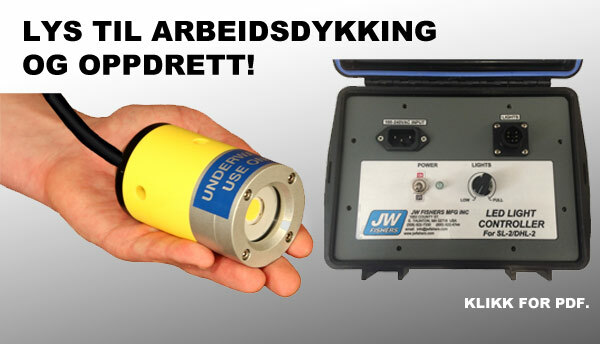 Det andre alternativet er et ekstern 100 watts lys. Her vises MC-1 kameraet med den interne lysringen. Du vil garantert få nytte av dette "handy" kameraet til JW. Fisher. 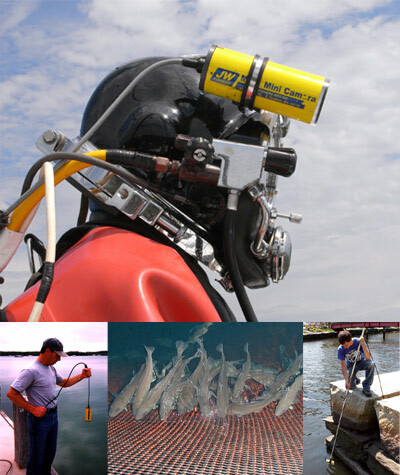 An underwater camera system designed for boat deployment. 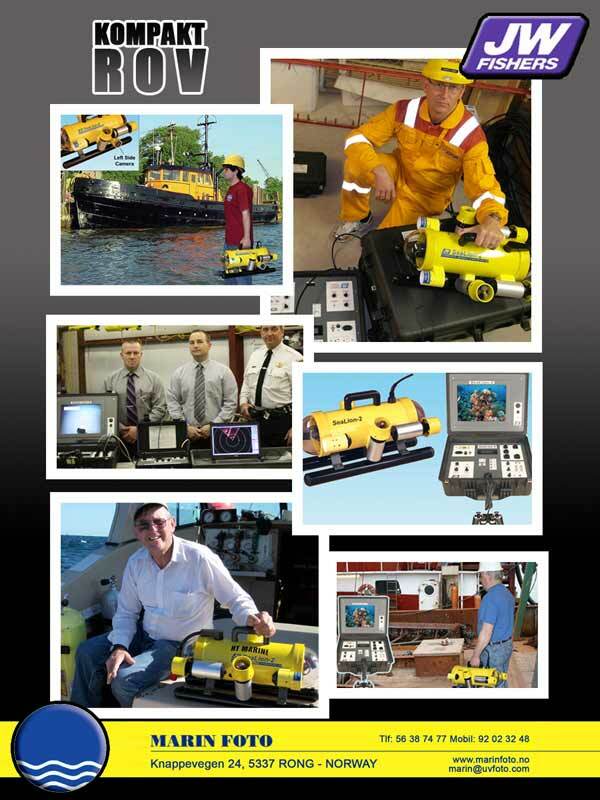 The DV-1 dropped video system provides a cost effective method for underwater search operations and inspections. The system is deployed over the side of the vessel and lowered to the bottom. Targets can be verified and recorded without incurring time consuming check out dives. The camera is capable of both downward and side viewing. Topside the DV-1 connects to a video monitor or standard TV. 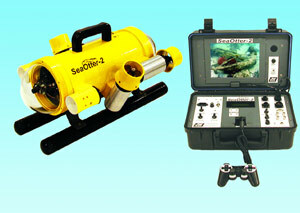 The video can be recorded on any VCR to make a permanent record of that favorite dive site or an inspection job. 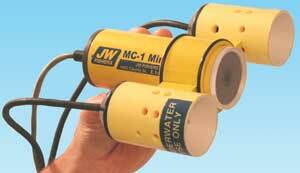 .two high intensity 100 watt underwater lights, and a 150 foot deployment cable. 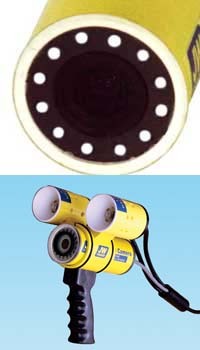 The underwater lights employ a unique water cooling system which allows many hours of operation without the need for bulb replacement. Options for the system include cable lengths up to 1,000', color or very low light B&W cameras, color or B&W monitors, PAL cameras for European use, additional lights, 12 vdc or 220 vac voltage inputs, 500' and 1,000' depth rated housings. It's portability, rugged construction, and ease of operation. 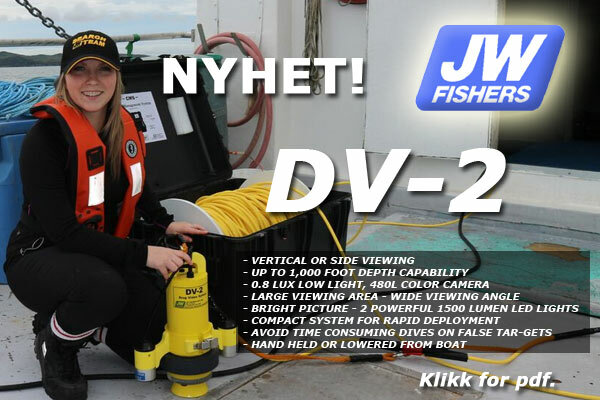 The DV-1 is backed by Fishers exclusive, unconditional TWO YEAR warranty. Nytt produkt fra J.W. Fisher, se PDF for spesifikasjoner og informasjon.